Prince William and the Duchess of Cambridge – formerly known as Kate Middleton – are expecting the birth of their first child any day now, an event that will once again bring the royal family into the spotlight, whether the public welcomes the news coverage or not. In December 2012, a quarter of Americans said they were “very closely” or “fairly closely” following the news that the young royals were expecting a child, who will be third in line for the British throne. Interest was greatest among Americans in the 55-64 age range, 36% of whom said they were following the news. But by and large, most Americans say they do not follow news of the British royal family, according to polls Pew Research has conducted dating back to 1986. When we have surveyed the public about news stories they are following, at least 60% have said that they are “not too closely” or “not at all following” royal news on seven different occasions. The one exception, of course, was the sudden, accidental death of Princess Diana in 1997. At that time, an overwhelming majority of Americans (85%) said they were following news about her death very or fairly closely, making it one of the top news stories of the 1990s. The young royal couple has drawn only modest public interest. Their highly anticipated wedding in April 2011, which reportedly attracted a worldwide audience of 3 billion, was not even the top story that week in the Pew Research Center’s News Interest Index. Just 35% of Americans said they followed the event very or fairly closely, well below the percentages closely following rising gas and oil prices (77%), deadly spring storms in the South (74%), and the Arab spring protests (47%) that same week. 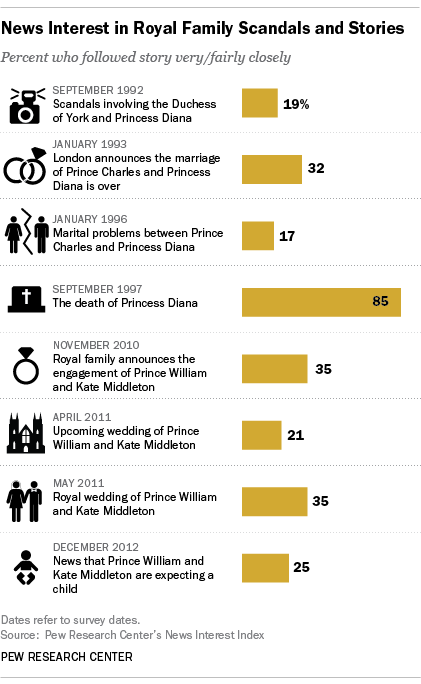 The wedding event drew 11% of all U.S. news coverage. But Americans were nonplussed: 64% viewed the amount of coverage as excessive. While barely a third of all Americans (34%) said they tuned in to the pageantry, the royal nuptials attracted a relatively large following among older women: 53% of women 50 and older said they were following news of the wedding. By other measures, the birth of the royal baby is expected to bring in $375.7 million in retail sales by the end of the summer, according to the British Centre for Retail Research. The Washington Post also reported that since the royal wedding, the duchess has been featured on more People magazine covers than any other celebrity. 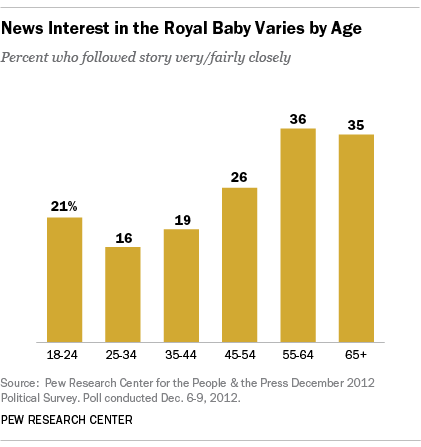 Pew Research Center for the People & the Press will be back in the field tracking public interest in the expected birth of the royal baby this weekend.